William Eugene Smallwood – Gene (also known by many as “Mean Gene”) – was born in Missouri on September 10, 1936. His family moved to Colorado when he was two-years-old. Gene attended school at Buell, Eaton and Greeley High. He joined the U.S. Navy and became a Navy Seebee in February of 1954, when he was 17-years-old. After boot camp, he spent a year each on Adak, Alaska (one of the Aleutian Islands), Midway Island, and Coronado Island in California, working as a heavy equipment operator. He earned the degree of “skill driver” and “chauffeur examiner” in 1956. He was also awarded a “Good Conduct” medal and served in the Color Guard. Gene enjoyed being chosen to drive the staff car for the #1 Four-Star Admiral while on Midway Island. (He also became interested in barbering, his life-long occupation, while cutting some of his buddies’ hair!) He was honorably discharged in September, 1957. On June 26, 1955, while Gene was in the service, he married his high school sweetheart, Janice Meeker. They were together in California; and after his discharge, they moved to Denver, where he attended barber school, graduating from State Barber College in April, 1958. Then they moved to Eaton, where they have made their home, and Gene has been cutting hair at “Gene’s Barber Shop”, for the past 60 years. When Gene started working in the shop in 1958, haircuts for men were $1.25 and for kids, $1.00. He has cut all kinds of hairstyles over the years, he still enjoys his work, and he has no plans to retire at this time. Gene has been involved in many community organizations over the years. He served as a Cub Scout Master; and president of the Eaton Lions Club and member of the Lions District Council. He was a volunteer fireman, and a president of the Eaton Band Boosters. He also served as vice-president of the Windsor Boat Club; and as a Guardian on the first Honor Flight of War Veterans to Washington, DC to visit the war memorials in that city. He is still a member of the Northern Colorado Model A Club. In 1967, during Eaton’s Diamond Days (a special celebration of Eaton’s 75 years of history, from 1892 to 1967), Gene presided as “Judge Roy Gene” – a comical role, in which he ruled over the events of that celebration – and had great fun doing it! Janice (Meeker) Smallwood was born on May 4, 1937 in a house on Cheyenne Avenue in Eaton that is still there. But she was raised on farms in the area, attending schools at Gill, Ault, and, mainly, Eaton. During high school years, she was a member of the Pep Club and Rainbow Girls. Jan and Gene were high school sweet-hearts, and they were married on June 26, 1955 at the First Baptist Church in Eaton. They raised a family of three children: Mike (Toni) Smallwood of Johnstown; Brenda (Roger) Zimmerman of Johnstown; and Brian (Lanay) Smallwood of Eaton. They have been blessed with nine grandchildren and 11 great-grandchildren. Jan and Gene are members of the Evangelical Free Church of Eaton. Jan enjoyed being a stay-at-home mom and, especially, being able to attend all of their children’s school and extracurricular activities as they were growing up. During those years, she was also quite involved in church and community activities. In later years, she worked outside the home as an office receptionist for several years, and as a product demonstrator for Meadow Gold Dairy for 25 years. Jan was a charter member (since 1966) of the Eaton Sundowners Service Club, and both Jan and the club are still actively serving the Eaton community. She also was the pitcher for slow-pitch softball teams for 25 years (one of those teams went to the National Senior Olympics twice). She also enjoyed playing on a volleyball team for several years. Now she does volunteer work, belongs to a ladies’ card group, rides her bicycle around town, and works in her flower gardens. She especially enjoys spending time with Gene and their family, and family life has always been very important to the Smallwoods. Over the years, Jan and Gene have enjoyed doing special things together, including touring with their motorcycle and Model A car, camping, water skiing, enjoyed square dancing for many years, bowling, entering and/or visiting vintage car shows, and playing cards with friends. They have also been para-sailing in Mexico, traveling overseas, taking an Alaskan cruise, zip-lining in mountains, and sky-diving (to celebrate Jan’s 75th birthday!). Both Gene and Jan consider it an honor to be chosen for Grand Marshals for Eaton Days this year. They have seen many changes take place in Eaton over the past 60 years, and they feel blessed and grateful for all the good friends, good times, and good support of Gene’s business during all the years they have lived in this special community. 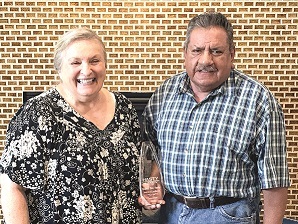 Pictured: Judy Mericle, left, recipient of the Eaton Days 2017 Jim Hasty Award of Excellence, congratulates Tony Gutierrez, the 2018 recipient of the award. Tony will be recognized during the Friday night street dance and presented his award. 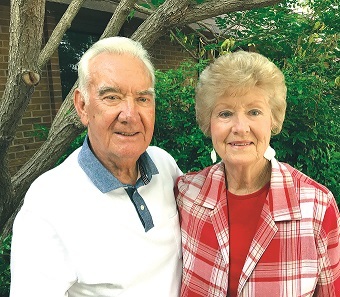 He and his wife, Georgia Ann, will ride in a vehicle following Grand Marshals Gene and Jan Smallwood in the Eaton Days parade Saturday morning, July 14. Tony Gutierrez, 75, will be presented with the Eaton Days’ 2018 recipient of the Jim Hasty Award of Excellence for his service to the Eaton community. The presentation will take place Friday night during the Eaton Days street dance on July 13. Tony was born June 20, 1943, in Greeley, CO. He attended Eaton High School. He served in the United States Army from 1968 to 1970. He was honorably discharged. Tony and his wife Georgia Ann, were married March 10, 1973, in Nunn, CO. They have a son, Jesse James Gutierrez. Tony and Georgie said they don’t have any grandchildren, however, they do have “grand dogs” named Kiki and Maddie. Tony was employed by AgLand/Agfinity from April 1972 to October 2017 when he retired — a total of 45 years. AgLand had presented Tony with their Customer Service Excellence Award in February 2000. Tony and Georgia Ann are members of the Evangelical Free Church of Eaton. Tony likes to spend time volunteering at the Weld County Food Bank. And when he’s not busy with that, he likes to tinker around with model railroading and doing jigsaw puzzles.